Yay another post! Today has been a crazy day! Some days I get sucked in to Facebook and then it takes me all day to keep up with all the comments and replies. Today has been one of those days. I managed to monogram a backpack (not the one in this post) and edit these pics for a new blog post on Fast Frames. I also have a great new post on Monogram Wizard Plus but will save that one for tomorrow or another day this week. 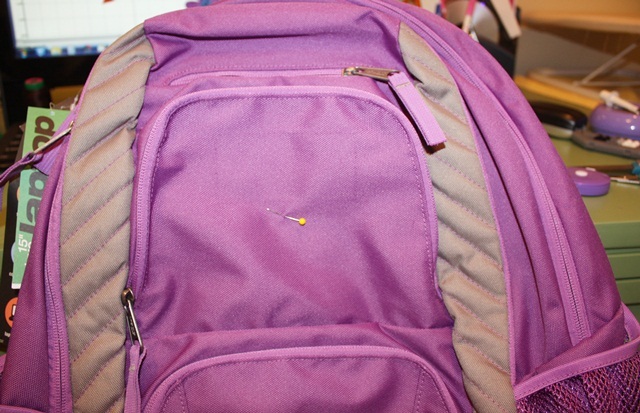 This, my friends, is a backpack (duh). You may be able to tell that my friend who sent this to me to monogram took the tag off (right above my straight pin). Her daughter is going in to 4th grade (I think??) so she said do her name, and that she’s in to peace signs! Sounds like a call for MINI DESIGNS! First I pinned my center of the top part of the front pocket (flap, we’ll call it). I got my name together merged with a couple of cute mini designs. 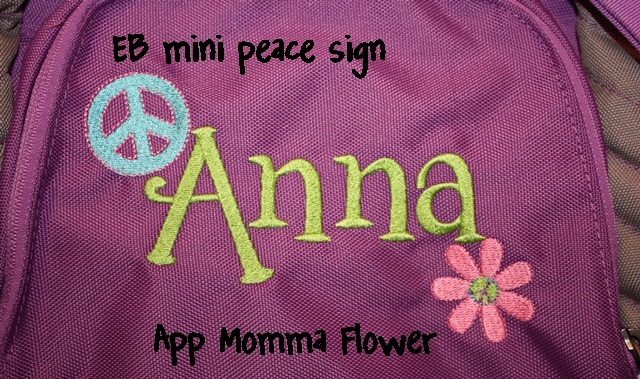 The peace sign is from Embroidery-Boutique and the Flower is from Applique Momma (it also has a peace sign in the middle). I used Monogram Wizard Plus Specs font. I love the font and it’s great for initials, but names are tricky. It spaces out rather strangely. I will explain all that in my next MWP post this week, but in the meantime you can see that I layered this name together IN Monogram Wizard Plus so that it all lined up and/or was spaced correctly. Layer 1 – A, Layer 2 – nn, Layer 3 – a. I then saved it and merged it in to my Sew What Pro. I added the mini designs, centered the whole thing and then saved it to my machine. I saved this in a 5×7 hoop space but will use my Fast Frames. Now it’s time to pick out the right sized Fast Frame. This one measures 7″ x 8″. I very loosely cut my sticky stabilizer (from Sewingmachine.com). You want to cut it bigger than your frame so that it’ll overlap the edges of your frame. Peel the paper side off to reveal the sticky side. Stick it to the bottom side of your frame (see photo down below which illustrates a little better what the “bottom” is). Hint: Your frame should slope down from where you attach it. Wrap the edges around the frame. Doesn’t have to be all neat and perfect. 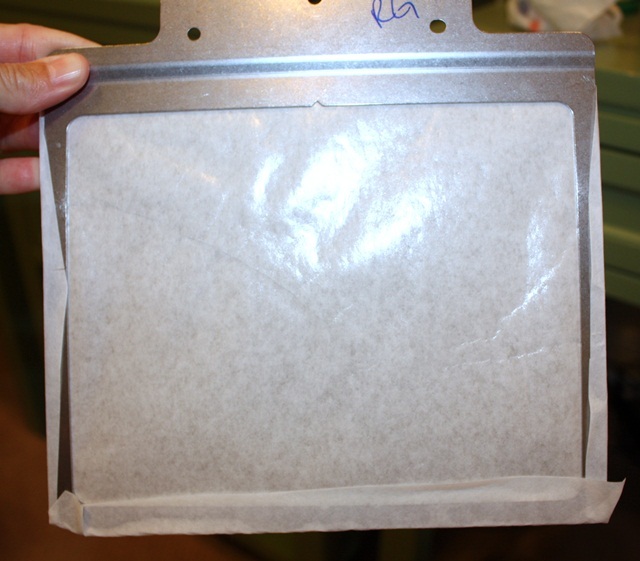 I then “stick” the backpack flap to the sticky paper on my fast frame. 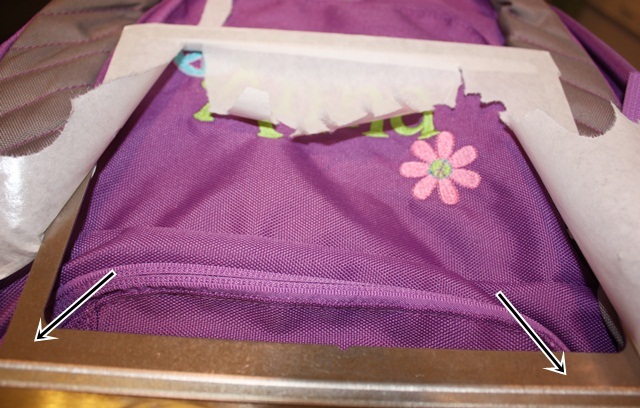 I usually line the top of the flap up with the top of the frame and then pin it in place with straight pins. This also shows me my borders. Since multi needle machines don’t technically recognize fast frames, you have to check the outer border of your design to make sure the needle won’t hit the edges of your frame. Here is how your fast frame should attach to the frame ~ it slopes down. That’s how you know what the bottom of your fast frame is to attach the sticky paper (believe me, I have stuck it on there upside down and backwards). Blah blah blah sew the design AFTER testing your borders and here’s the outcome! I use FILL STITCH instead of satin stitch. 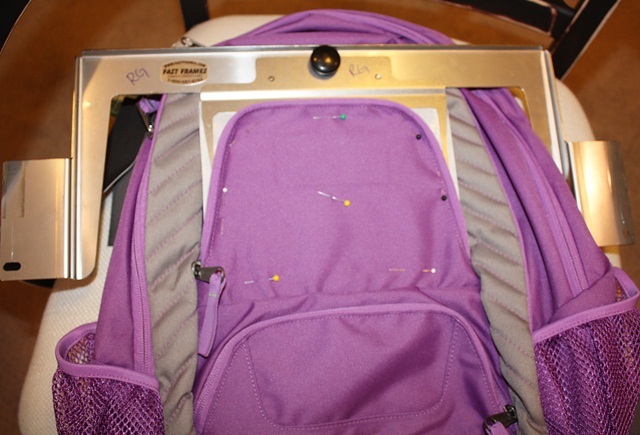 Since this is a backpack I wouldn’t want the satin stitch to get snagged or pulled. 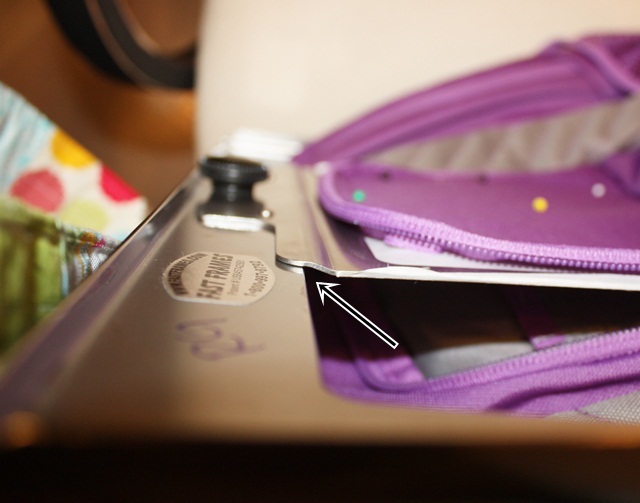 I peel the sticky stabilizer/fast frame off the flap and as you can see it leaves a little inside the letters. You can peel that away easily. Get under it w/ scissors if need be. 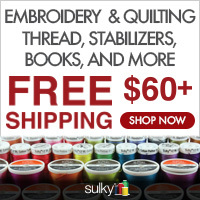 The sewingmachine.com sticky stabilizer is just sticky enough and comes off great! I then peel the sticky paper off my frame. As you can see it comes off very easily with no residue left on the frame. Here is my finished backpack! Again, stay tuned for my next post on another Monogram Wizard Plus trick. Followup to my last post on MWP ~ here is a link to the Facebook Page – click HERE. As far as the Yahoo Group I mentioned… I am not a member of it. I just heard about it on the Facebook page. Evidently it’s a private closed group and they are currently not accepting new members! Check out the Facebook page! So far I’ve seen a few great tips on there! 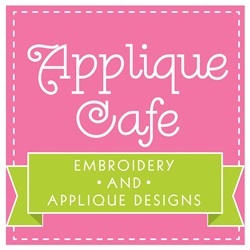 We are celebrating 3 years of Applique Cafe, so all designs are 1/2 off through next Wednesday, August 15th! What kind of machine do you have to have to be able to use a fast frame? I have a Babylock sewing and embroidery machine. 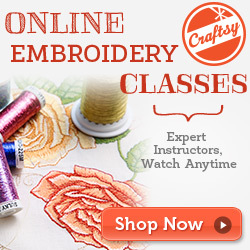 Was also wondering how to use “Sew What Pro”. Do you have a tutorial on how to use it. I have a 6 needle Brother PR650 machine. You can download a trial version of SWP at sandscomputing.com for 30 days! There might also be a manual? I am not sure if there any tuts on it in Helpful Posts? I was just thinking I need some of those fast frames!!! Thanks for the tutorial! I also have the Brother PR 650. Where did you purchase your fast frames and were they expensive? I looked into them last year when I bought my machine, but never got any. Thank you for this very useful post! Thanks for this post! 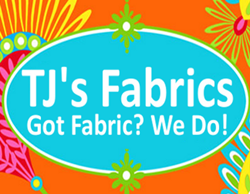 Is your fast frame 7″ wide and 8″ deep? I need to order a few more fast frames and want some that are 8″ deep, but want to make sure they would work on my machine (it’s the same as yours). I know I couldn’t embroider a design the whole 8″ depth, but it should still fit on my machine, right? Thanks! 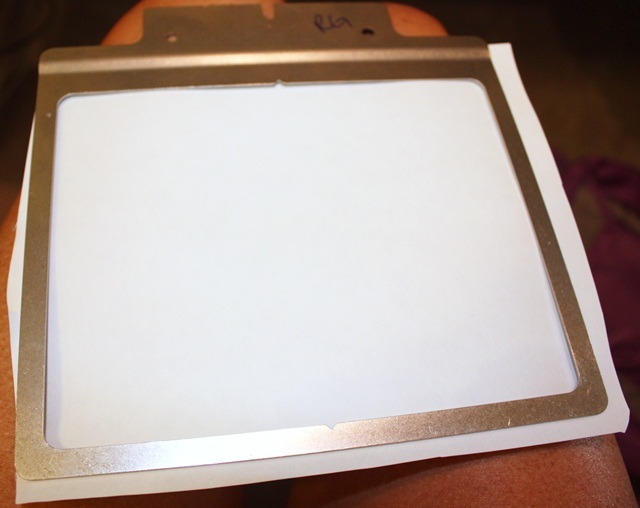 The frame I used is 8″ wide and 7″ deep. 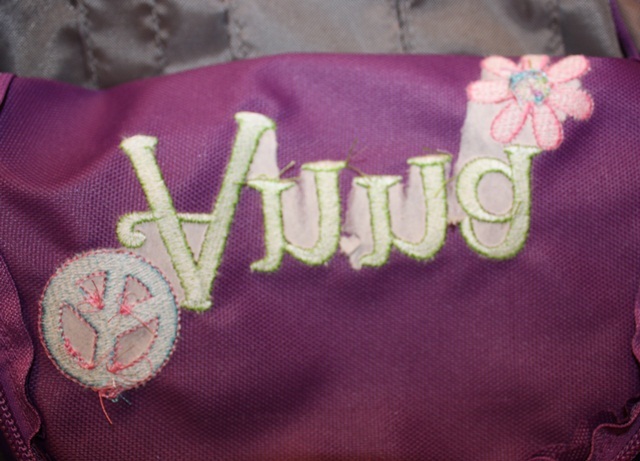 It worked perfectly for the “pocket” of the backpack I was monogramming on. Flap I guess? How do you keep the fast frames from vibrating so badly during embroidery? Mine don’t vibrate so much unless it’s a heavy bag or something. If that’s the case I just try to hold the frame down gently. What brand of sticky stabilizer do you use? I just got my Brother PR650 and fast frames yesterday and tried it out today. 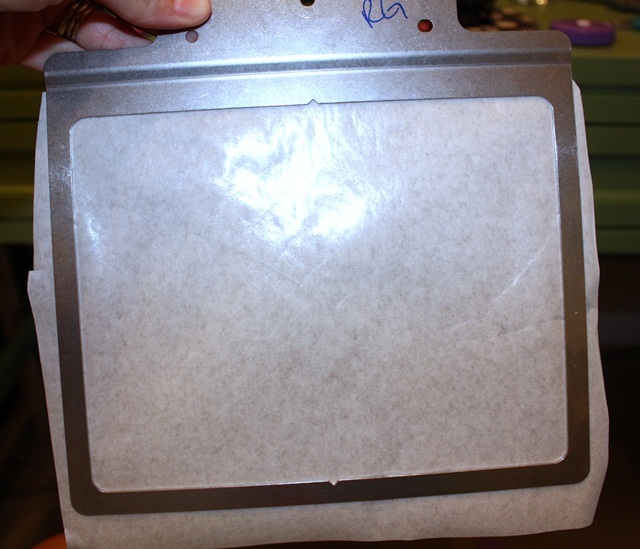 The sticky stabilizer that came with the machine is terrible – my frame is all sticky. 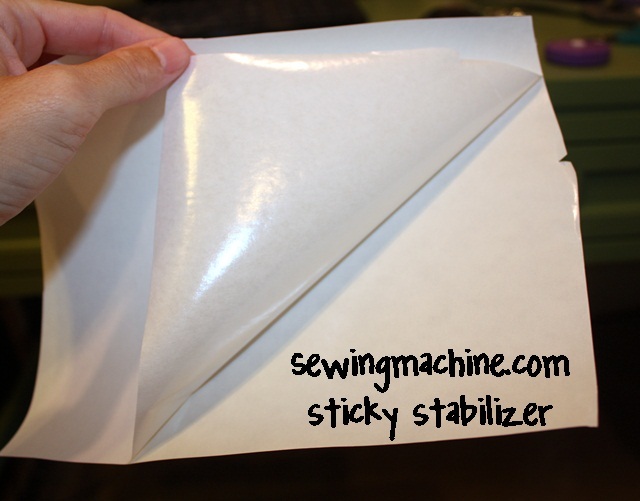 I use the commercial backing roll of sticky stabilizer from sewingmachine.com. Just search “sticky” and it will pull up all the different sizes of rolls. Ok, I buy my sticky from Sewingmachine.com too but it does not peel off that easily. Strange, huh?? I have icky little residue on my FF! 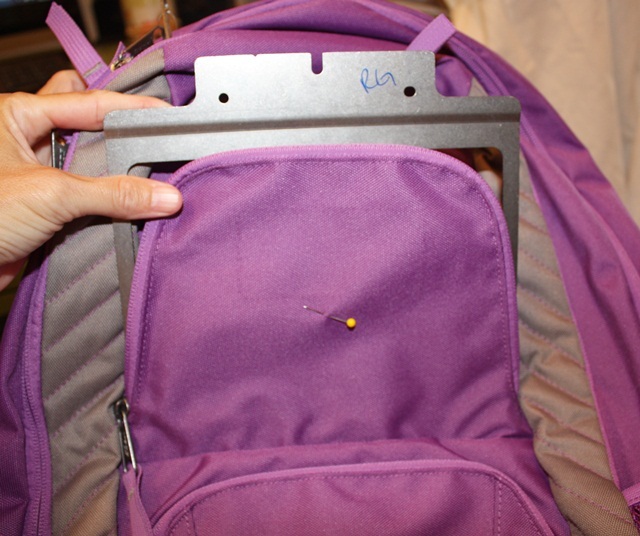 The backpack looks great! Thank you so much! I always have sticky residue left on my FF as well. However, I’ve never wrapped the stabilizer around the frame, just cut to fit the frame. Your fill stitch still looks a bit “satin-y”. Whenever I’ve done fill stitch, it’s been more flat. Is it the Specs font? 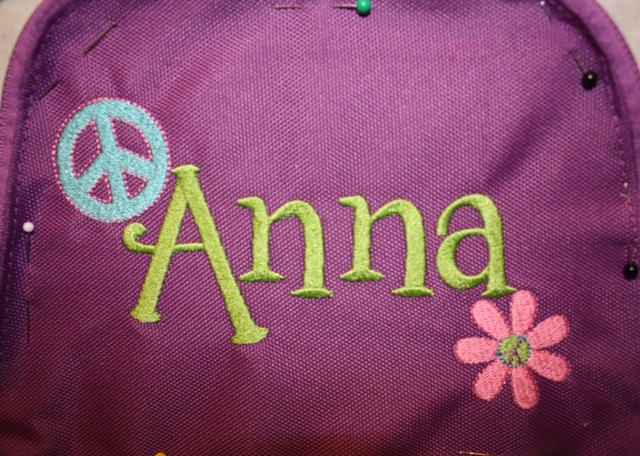 I’m not sure if it’s the font or the embroidery on the backpack? I did a piece of fabric today (Library font) and it seemed flatter looking at the picture of the backpack, so I think it’s the surface! This may sound like a really dumb question but I just got my first embroidery machine for Christmas and am trying to read as much as I can and appreciate any info that might be helpful! My machine is a PE780D. When I get ready to download files that I buy will they come up on my computer as yours did or is that a special program you have downloaded? I am so excited and need to get busy. Also are there any recommendations you would have as to what is the best things to start out with to get use to my new machine? Thank you!! Love the backpack and hoping i will eventually be able to do something such as that for my kiddos! I recommend Sew What Pro from http://www.sandscomputing.com. It’s $65 and you can try it for free for 30 days. It allows you to open the design files and SEE them on your computer. You can also use it to merge a design w/ a name or initials and do a few other things. I LOVE IT and it’s an inexpensive program! I have the 8 in 1 and that’s all I use. I have a big one but I’m not even sure if I’ve ever used it! 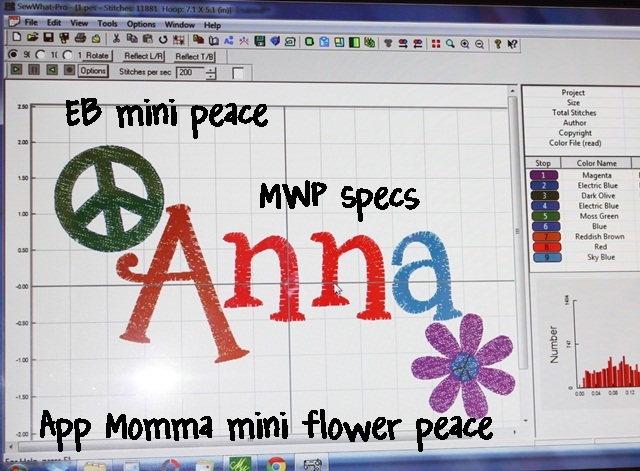 I got MWP first when I got my machine to do fonts. QUickly learned I would like to merge, and SWP was a great and cheap option! I’ve used both for years so that’s just what I know! I am also trying to embroidery an “A” on a zipper pouch. Every time I try the back side hits the bobbin holder area and it pushes it off etc. Any ideas?